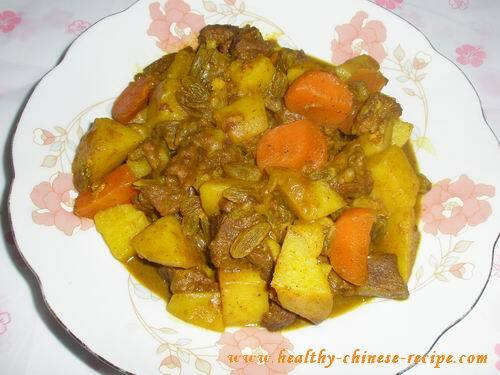 Braised Beef with Potatoes is a very popular Chinese home cooking dish. It's originated from Hungary, then spread to the former Soviet Union. In 1950s China learned everything from former Soviet Union, calling it Brother. So this dish is jokely called Communist dish. The potatoes absorbed the beef flavor, taste soft and fragrance; The beef is wrapped by the potato powder, which makes the mouth feel of beef more comfortable. Combining beef soup and potato powder, the juice will make you try to stop but cannot when served with steamed rice, or dip by steamed bun or bread. Beef will take longer time to be cooked than that of potatoes. If you cook beef and potato at the same time, the potato blocks will solve and become powder when the beef is cooked. So if you want to eat potato blocks, you'd better boil or stew beef to half cooked, then add in potato blocks. This is the most delicious cooking method. Beef is not afraid to be cooked longer time. The longer time, the soft and tender the beef. The condition is that you should use low heat. Usually I simmer beef for 60 to 90 minutes till beef is cooked. Actually you can simmer a lot one time and store them in the fridge. When you want to prepare stewed or braised beef dish, you can use them. (So that you can save time ).Of course, this is not the most delicious way. Further more, I like to add a lot of water, so it can produce much beef soup which I'll use in many soups and dishes. All these will make beef dish to become light. But this is my philosophy, eat lighter is healthier in daily life. In some special day you can eat very strong flavor food. Otherwise your bud will become numb and you don't know what's delicious food. Always eating light flavor food will make your mind peace. Carrot is usually added in this dish. When cooked, carrot absorbed the flavors of beef and potato, plus its own sweet taste, super delicious. Original classic beef potato is soy sauce flavor. You can add tomato sauce or curry sauce according to your own taste and mood. Function of Braised beef with Potatoes: Supplementing the spleen and the stomach, strengthening tendon and muscles. Supplementing Qi. Eating too much will cause food stagnation. It's better to serve with vegetable salad.